These are so precious such an adorable and unique set which makes it a perfect gift for yourself or someone else. You'll get 1 bib, 1 monogram burp cloth- letter of your choice and 1 small Baby Bottle Holder Ball. The bib features a lovely bright and colorful owl print 100% cotton fabric on one side and super soft hot pink minky on the other. Top stitched and pearl snap closure for added durability. Bib measures 11" x 8.5"
The burp cloth features the same beautiful owl matching print. 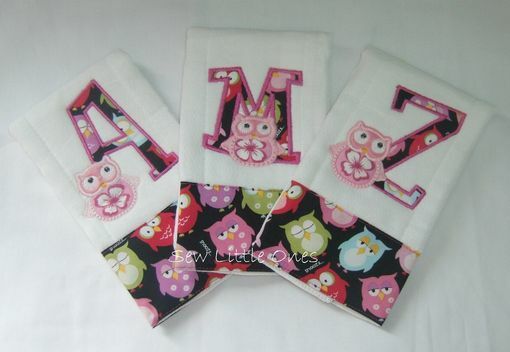 In addition, you may add any letter of your choice from (A-Z) to have monogrammed on it. Each burp cloth measures approximately 17"x 19"
Set also includes Baby Bottle Holder Ball. Not only can it be a bottle holder but also act as a great activity ball. Your babies and toddlers would love this cuddly, colorful activity ball. With so many openings it provides lots of places for little hands to grab on to. It tumbles and bounces softly but won't roll away like ordinary balls would! This ball is great for stimulating baby's sensory development. Measures 26" round. Please feel free to convo with any questions.